Breeze helps salespeople manage sales and close more deals. Why use Breeze to manage your sales pipeline? Breeze is built from real-world experience, it's small and personal, and adapts to your needs. Fast based work, constant feedback, and improvements are at the core of Breeze. It's designed to be easy to use by everyone, not only by salespeople but anybody who wants to get organized and close more deals. A simple board with all your deals. See the status of every deal and actions to take. Collaborate with your sales team and share ideas, track goals. Work anywhere, anytime. Know whether you are losing or winning deals. See who's doing what and when. See all your sales leads in a visual pipeline. Instantly know at which stage all your deals are, whether you have enough deals to reach your goals, as well as understand if some deals need more attention. Send your sales leads directly to Breeze or add feedback to existing ones. Use project boards to manages sales pipeline. 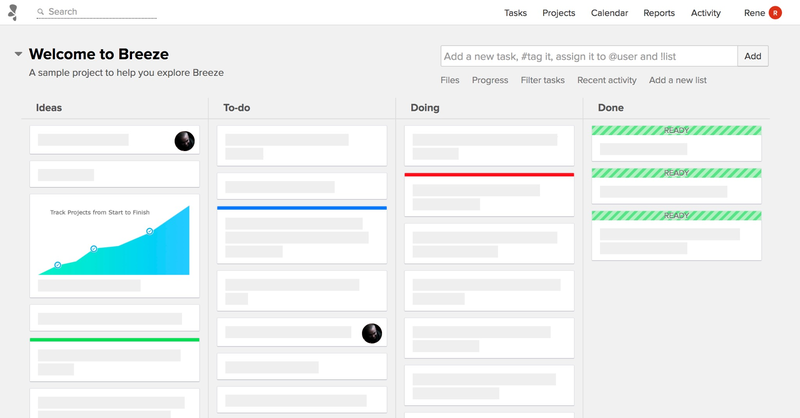 Turn them into boards or simple task lists. Discuss every detail of your sales lead, track progress, and keep everyone on the same page. Schedule follow-ups in the calendar and never miss out on crucial follow-ups again. Use custom fields to track all the details - phone numbers, emails, addresses, cost, lifetime value, or anything you can imagine. It's the simplest CRM you'll every use. See how many deals were closed and how many are open. Get an overview what was done and when.